Its antioxidant properties aid in skin’s anti-pollution defense, while also visibly diminishing wrinkles and other signs of ageing. Its high saturated fat content moisturises dehydrated skin. Before you run out to buy coconut oil, it’s important to know which kind you should use. Unrefined “virgin” coconut oils have an advantage in that they test higher in antioxidant levels than refined (bleached and “deodorised”) coconut oils. The tricky part is that there is no worldwide certification standard that specifies which coconut oils can be classified as “virgin” and which cannot, so a company can say anything it wants to. How to use: If your coconut oil is in solid form, scoop a teaspoonful into a microwavable bowl and heat it up for a few seconds (but not too hot) to get a fluid, more spreadable texture, and then apply it to skin. We strongly recommend layering it with a well-formulated moisturiser to give your skin an even broader array of beneficial ingredients. Coconut oil has good properties, but skin is complicated and has more diverse needs than any one ingredient can address. This is another bust, and one that actually puts your skin at risk. 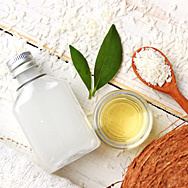 Contrary to claims, coconut oil does not provide adequate sun protection for skin. Research has shown that it screens only about 20% of UV light, which means 80% is still getting through to your skin. Skipping your sunscreen in favour of coconut oil puts your skin at risk for skin cancer and early signs of ageing—eek!